The Telecom Regulatory Authority of India released a comprehensive report yesterday on the growth of Indian telecommunication Industry for quarter ending March 2009. We are publishing a 3 part series that will highlight the performance of Indian Telecom sector. This is the 2nd part of our Indian telecom report series which looks at wireline subscribers (normal wired telephones) in India. These number have been pretty stagnant since last 2-3 years thanks to the explosive growth of Mobile Telephony. Following Charts and Graphs will explain the situation of wireline subscribers in more detail. 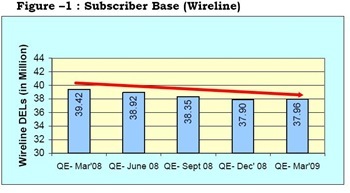 At the quarter ending March 2009, India had a total subscriber base of 429.7 million subscribers. The interesting aspect in this chart is the growth in rural subscribers. 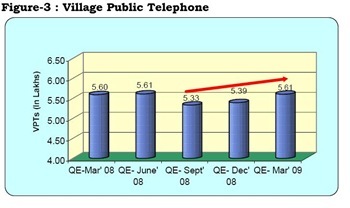 The rural subscriber base has risen more than double over last year. But, the number is still miniscule as compared to the total rural population of India. The growth has of wireline subscribers has been pretty stagnant over last couple of years sure to obvious reasons – the advent of cheap mobile services, probably even cheaper than normal wireline services. Check out the last two points – Nearly 30% of all wireline telephones are PCO’s and VPT. Very soon, those will get converted into MCO’s (Mobile Call Offices) as well ! 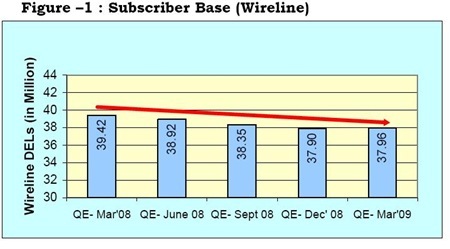 Infact, wireline subscriber base has contracted by nearly 2 million subscribers over last year alone. This trend is going to continue for a foreseeable future – Infact, I don’t see it stopping till the very end ! 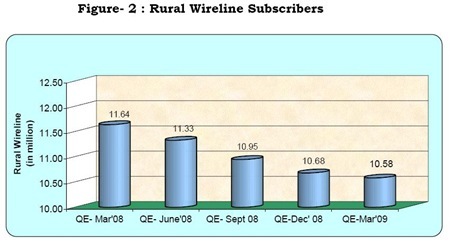 I don’t think I need to write anything here, usual wireline rural subscribers negative growth ! 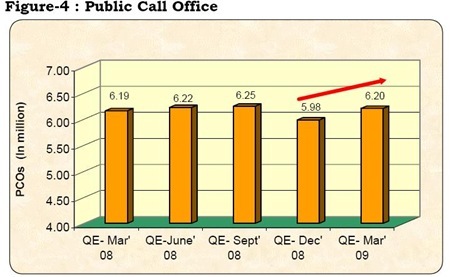 What actually surprises me is that in last quarter number of Public Call Offices grew compared to Quarter ending Dec-08. Can somebody please explain me this? 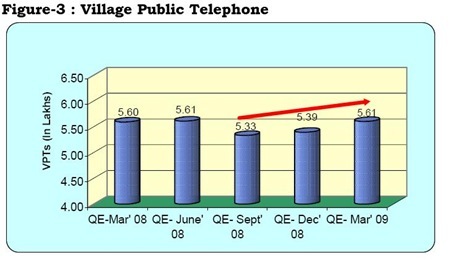 Ditto for Village Public Telephones as well? Infact, it has shown growth, although marginal, for last 2 quarters. Probably, I am not aware of some initiative that the telecom Department has launched for Rural Indian Villages, otherwise this growth seems inexplicable. Are any readers aware of such schemes? That concludes our 2nd part in the series of Indian Telecom Report. Verity Technologies is a Mobile Services Company in the domain of Authentication and Identity Services. It has historically been a provider in the Mobile Value Added Services and credited with participating in the setting up of the worldâ€™s largest and most sophisticated Data Service vending mechanism at Reliance Communications, India. Telecom, Financial Services (Electronic Commerce + Plastic Money) and Entertainment are among the 3 fastest growing market segments. Verity is positioned to harness the power of the mobile medium to deliver customer value around Entertainment and Financial Services. It has access to over 200 million mobile subscribers in India through its Mobile Operator Relationships. Also its content Brand â€˜Mocazoâ€™ is the first of its kind initiative that uses the power of Social Networking. Its ongoing relationship for service offerings with leading organizations across the globe reiterates Verityâ€™s technical expertise and domain knowledge encompassing both mobile & internet technologies. Wireless is the best telecommunication source because in wire lines, many faults happen.